When I was a child, I played with dolls. That’s no great revelation for a little girl growing up in the 1950s and ’60s (yes, I’m that old!). I am the sixth of seven daughters, so my younger sister and I had not just our own dolls (new every Christmas) but all the abandoned dolls of our older siblings. I fondly recall a whole corner of the room we shared populated with dolls of every shape and size and color. Most of these dolls didn’t do anything. They didn’t walk or say “mama” or perform any tricks, they just opened themselves to our imagination. Eileen and I WERE their voices, we moved them as we chose, we assigned them names and personalities. The one exception to not doing anything was my doll Agnes, who came to me at about age 7. I remember marveling on Christmas morning when my mother showed me that Agnes could answer questions “yes” or “no” with a nod or a shake of her head. Even when I understood that the button on her belly was “yes” and the button on back produced a “no,” I still found it marvelous. 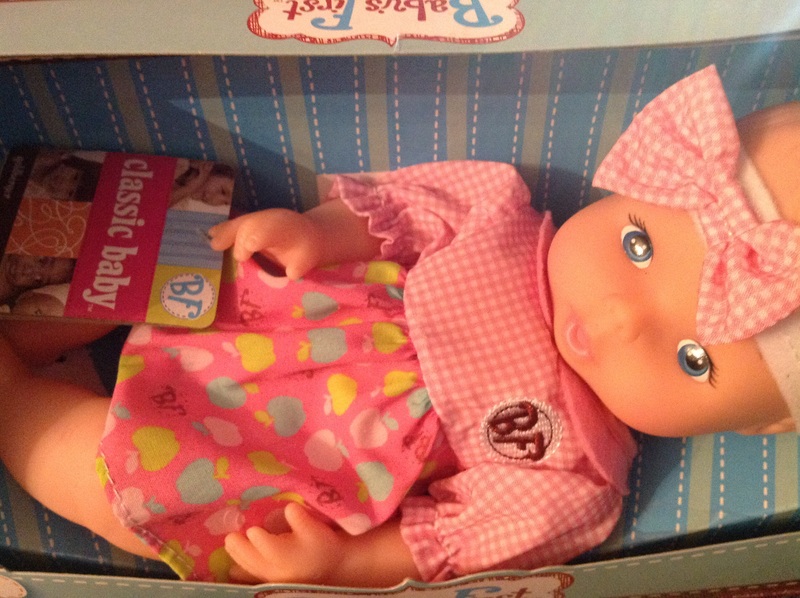 Maybe that same year, Eileen got her Betsy-Wetsy doll and could change its diapers (cloth, of course). None of our dolls, I also recall, were the characters of movies or TV shows (now, with our paper dolls, that was a different issue, but that’s for another day). We did have Shirley Temple dolls that we loved, but Shirley was so many characters wrapped up in one that we were never limited to the roles our ringleted little friend had played. We loved our Ginny dolls, who were about 6″ tall and had lots of fun outfits. (I still have my Mary Ann’s tiny Dutch wooden shoes.) Barbies didn’t enter our collection — we (and definitely our mother) were not interested in glamour but in imaginative play. Why is all this so important to me? Because playing with the imagination is the best part of playing dolls. Whether they’re babies that help us be pretend mommies and daddies, little-girl dolls like the Ginny (or American Girls today), or even the bears and bunnies and ponies that accompany our children to bed, these toys are the ticket to a world of imaginary adventures that take girls AND boys beyond their everyday world and, most importantly, beyond themselves. In my Godly Play room, one of the favorite lessons is Baptism, which includes baby dolls (in my room, three babies with different skin tones). Part of the appeal of this story during work time is the opportunity to handle the “babies,” and I am especially touched to see boys — perhaps for the only time in their lives — enjoy the pleasure of these pretend little people and the nurturing role the dolls inspire. Playing with dolls may help children imagine the things that they see (playing games of ‘as-if’) but it also opens the gateway to imagining things that no one has ever seen (‘what-if’), and isn’t that the kind of play that can help us imagine our way into the kingdom of God? Let us pray for a kingdom of love and compassion and hope and redemption and joy; and above all, let us play. One day, I’m going to create a blog around preaching with children and post my sermons there. I take them very seriously — it’s not a light thing we do. If you are reading this because you’re drawn to the Godly Play theme of this blog, you already know that! To begin, I’m going to post here some “how-to’s” — purely subjective (especially my aversion to puppets) and mostly derived from my Godly Play experience. As a chaplain serving a lower school (grades Jr. K to 5) for the past 6 years, and as a parish priest, Sunday School volunteer, and parent over the years, I believe I can offer some guidance. Ah, the children’s sermon . . . Everyone has to do it, and no one teaches you how!! one of these days I will teach a course, since no homiletics professor I know considers it a subject worthy of their time. I am no expert, but I do preach with children every week at school, and about once a month at church. Notice that I saw “preach with,” because I just don’t like the sound of “preach to.” I use the same language about adult sermons. It is a two-way conversation, a dialogue, even if only one person is speaking out loud. DO preach with as few notes as you can. As noted above, I do prepare a manuscript. It’s a necessary part of the process for me. When possible, I preach without text. But when using the manuscript, I know it well enough that it’s really a prop and most of the time, my eyes are on the congregation. If you are a Godly Play practitioner, you are well prepared for speaking from the heart. MORE IMPORTANT than whether you use notes or not is whether you love what you’re saying and convey it in a way that shows you love the children, and that God loves us all. DO smile 🙂 not that I have to tell you that. DO your usual exegesis! Many people believe they can find a children’s sermon in a book because a) they are out of ideas, 2) they are afraid of children or 3) they do not think that study is worth their time for “just a children’s sermon.” I know this because I worked at a seminary library, and every Saturday some student would come in asking for a book they could use for a children’s sermon *the next day. * 😦 Just as in an adult sermon, you will not “show your work” in your sermon, but you will have something to say if you engage the text in a serious way. DO tell stories! Either from your own experience or from a book or movie the children know. DO use an object(s) if they help you make a point. Do not feel that you MUST have something to show (a la the “brown bag” sermon schtick) — but children are fascinated by something as simple as pouring water from a pitcher into a bowl, or using a cornucopia filled with familiar and strange fruits/vegetables to talk about God’s generosity. ask the children questions in front of the congregation. I know, I know, this is what many people expect. It puts children on the spot. It encourages them to be entertaining, to get a laugh; or it embarrasses them and discourages them from sharing their thoughts. Either way is IMHO disrespectful. Resist the people who want the children to say “cute” things for the benefit of the adults. No one expects adults to share their responses to the gospel out loud in front of their peers. Also, It can also be hard to regain control once the competition to answer begins. DON’T tower above them if they are sitting up front in the chancel. Sit with them. If the adults can’t see you, that’s OK. (Personally I prefer to have the children stay with their parents — it discourages the kind of “performance” mentality described above. DON’T call them “kids” or “kiddies.” Not that you would. I have a personal distaste for “boys and girls” which I can’t quite explain. DON’T necessarily end with a moral. One of the homiletics gurus who dismissed my request that he cover children’s sermons replied that all children need is a moral. NOOOOOO – they need stories with which they can make their own meaning. This doesn’t mean that you don’t interpret the lesson for them. But pat answers and platitudes are not what children need. DON’T use puppets if you can help it. Again, just a personal bias 🙂 Puppets creep me out. You can tell I’ve heard a lot of bad, and good, children’s sermons. I am sure I’ve preached my share of bad ones, but I always strive to do better. Jeez, I thought I didn’t have much to say. In summary avoid the canned crap and treat the children and the text with the same respect you would give their parents and grandparents. If you love God, the scripture, and the children, they will know it. YOU WILL DO GREAT!! When is the last time you were outraged? I don’t mean frustrated by an empty coffee pot (horrors!) or irritated by a fellow driver who thinks their needs outweigh your much-more-legitimate desire to get to church on time. I mean OUTRAGE, sparked perhaps by a headline in the paper or a meme on Facebook that signals — once again — the imminent decline of our civilization. Something like the shocking picture from Governor Northam’s yearbook; or that video of high school students facing down a Native elder; or even trash talk about a certain New England football team winning ANOTHER Super Bowl tonight ¾ unless, of course, the Patriots are YOUR team and then it’s not outrage, it’s prophecy. In today’s gospel, the folks in the Nazareth synagogue were outraged, and they had good reason to be, because they had just heard something outrageous. And not from some distant source but from one of their own ¾ a home boy half of them had helped raise. Today’s scene opens with a recap of the gospel we heard last week: Jesus entered the synagogue in his home town on the Sabbath, recited the 600-year-old words of the prophet Isaiah, and promised his neighbors, “Today this scripture has been fulfilled in your hearing.” If this were a film, it would fade out with a glow. Today, though, we tune in to the sequel, and it’s a shocker. At first, it looks like everything is going smoothly, as the congregation admires the gracious words of the preacher — “Isn’t this Joseph’s son?”. But they weren’t really listening to what he read. And who can blame them, really? Even the most scalding words of scripture, repeated over centuries, can lose their heat, and heart-rending lamentation sound more like a lullaby. Jesus, you may recall, had just spent time alone — alone with his Father, and his own temptations — in the desert (we’ll hear more of that story in just a few weeks). He must have spent those 40 days and nights listening in his heart to the words of the psalms and the prophets, including the words of Isaiah, lodged in his memory though countless repetitions. As Paul reminds us today, without love, we are nothing. “The Spirit of the Lord is upon me, because he has anointed me to preach good news to the poor….” And all the rest of those healing, hopeful words. If only he could have left it there, he might not have left home forever. Because good news to the poor sounds so sweet that it’s easy to forget the upending, the disturbance, the reversal it involves. Maybe that’s why, while his family and friends were still remarking at his “gracious” words, his talk becomes grating. Proclaiming himself a prophet in their midst, he flings an accusation: Doubtless you will quote to me this proverb, ‘Doctor, cure yourself!’ Had they heard about how he’d healed people in the villages he passed through on his way home? Do they expect he will do the same in Nazareth ¾ where surely all their desires were known and very few secrets were hidden? Why on earth would he NOT rescue them from their troubles? Unless to make the point that his vocation was to something wider, deeper, broader. Unless to dramatically break ties with his hometown so that he could call ALL people to a new kind home. Unless interpreting “good news to the poor” through the lens of love had stretched his heart to the breaking point. So, through a heart that breaks for ALL God’s people — the poor, the marginalized, the wounded ones ­— he proceeds to tell the Nazarenes just how widely God’s mercy will work through him. And it is too much for them to bear. Now, I sympathize with the Nazarenes in what happens next — to a point. It’s easy, with the benefit of hindsight, to judge them harshly for not seeing who Jesus was. As far as they knew, he was one of them – and who THEY were, was God’s chosen people, God’s favorite children. So when Jesus reminded his neighbors that the long-ago prophets Elijah and Elisha brought God’s mercy to Gentiles ¾ feeding the widow of Zarephath, healing the leper of Syria ¾ they were not just irritated. They were OUTRAGED. That’s an easy emotion for us to comprehend. So easy, in fact, that these days people talk about outrage fatigue. Writing in the magazine Psychology Today, a therapist named Dean Olsher says that when we experience outrage daily over terrible things that we cannot control, it makes us feel helpless and can lead to depression. Amid hourly political bombast, routine violence, and constant assaults on civility, outrage is a ready response for me, and maybe for you. But to combat outrage fatigue, Olsher suggests taking action, even something as simple as writing a postcard to a lawmaker. I suggest (preaching to myself here!) we also learn to tamp down our outrage reflex, not wasting it on passing folly, but reserving it for the scandals that break God’s heart, like hunger in the midst of our nation’s prosperity, like violence and homelessness and every injustice that violates the law of love. These are the real outrages of our time. WHAT? my students ask. How did he do that? Was it magic? Did he have an invisibility cloak? A painting called “The Brow of the Hill” sheds light on the answer. Looking at this painting intently, I cannot find Jesus in it. Instead, I see dozens of men, all gesturing wildly and exclaiming angrily to each other, and I wonder: Were they so wrapped up in their own wrath that they hardly noticed when the object of their outrage slipped away? Never to return to Nazareth again, but to spend his life, to give his life, in outrageous acts of love: to preach good news to the poor, proclaim release to the captives, bind up the brokenhearted, recover sight for the blind, let the oppressed go free, and proclaim the year of the Lord’s favor. In this year of the Lord’s favor, as followers of our Lord, will we too bring good news to the poor, news that is not just words, but action? Will we take action for our neighbors who are hungry, afraid, violated, rejected, imprisoned? I believe we can break through our fatigue and be outraged on their behalf. And then, like Jesus, might we perform outrageous acts of love. Dean Olsher, “A Cure for Outrage Fatigue,” Psychology Today, December 28, 2018. “Brow of the Hill Near Nazareth,” by James Jacques Tissot, watercolor, between 1886 and 1894, Brooklyn Museum, New York, NY. Wait a minute, “Lay down our lives”? There are other ways, easier ways, to love. This challenge has been especially present to me this spring, as it has, honestly, since December 14, 2012. Giving up my life to save vulnerable others is no longer an abstract ideal that can be held at a distance, admired, aspired to, but never tested. As a chaplain and teacher, would I have the courage to stand between a deranged gunman and the precious children I teach, the way teachers at Sandy Hook Elementary did six years ago — the way adults at Marjorie Stoneman Douglas High School in Florida did three months ago? Every teacher in America has to look in that mirror, and in fact we all do, as violence can erupt anytime, at concerts, nightclubs . . . churches . . . just ask Mother Emmanuel in Charleston. Ordinary people perform acts of extraordinary love when faced with the choice that, to them, seems no choice at all. “I am the good shepherd,” Jesus says in today’s gospel, and the words sound rather sweet to us. Countless images of a gentle shepherd in a long, white robe cradling a lamb in his arms have shaped our understanding; and the familiar Psalm we hear today only makes us long to follow to those green pastures and still waters. That’s a fine beginning — but if we stay there, we miss the challenge in today’s passage. Instead of the word “good,” scholars suggest, listen to a more accurate translation. “Model” suggests that we who follow the Shepherd should follow his example, not just his road map to greener pastures and a cup that runneth over. Those who follow the Shepherd are meant to become shepherds, to face down whatever wolf threatens, and to lay down their lives in his name. That’s more than any ordinary person can achieve. Except when they do. I could tell you a story about an ordinary mother who did extraordinary things in the last century, as Paris filled with refugees from the Russian revolution and again as Nazi wolves overran the City of Light. I could tell you how this woman took vows as an Orthodox nun and protected Jews, smuggling them out of the country and hiding them in her home. As we ponder the news that one in five young people today have never heard of the Holocaust, it’s important to remember shepherds like MARIA SKOBTSOVA, who gave her life in a Ravensbruck gas chamber on Holy Saturday, 1945. But there is more than one way to lay down our lives. So I will tell you a story about a daughter of slaves who loved education, loved children and, above all, loved the Good Shepherd she followed. ANNA ALEXANDER was born on Saint Simon’s Island, Georgia, in 1865 — the year the Civil War ended and two years after the Emancipation Proclamation. Her parents, who had worked as house slaves, were highly educated. Using the Bible and the Book of Common Prayer as their texts, they taught their eleven children to read and to love learning. Anna took those lessons to heart and eventually went to teach in the public schools in Pennick, Georgia. She was disillusioned, though, when she realized she couldn’t teach the Church’s message there. So she joined the school one of her sisters had founded in a nearby town, and reveled in giving children a Christian education. It was there that a church service inspired her to start a mission back in Pennick — a difficult journey by foot and rowboat. With almost no resources — and no support from the Diocese — Anna’s congregation met in an abandoned farmhouse and then in an old store where the whiskey counter served as altar. To support the church, Anna kept teaching, took in sewing, and persistently begged for donations. Every weekend, she walked and rowed her way to Pennick, sometimes bringing a priest who would baptize the children she trained. Each summer, she cooked for the diocesan camp on St. Simon’s Island. As helpers, she brought small groups of African-American children who, though barred as campers, at least shared some camp joys. Maybe it was these same children, refused an education under Jim Crow laws, who inspired Anna to add a school to her mission church and to name the whole enterprise — appropriately today — Good Shepherd Church and School. Poor as they were, Anna never let her flock forget those even less fortunate. Proportionately, Good Shepherd gave more to needy folk throughout the world than any church in the Diocese. Having stared down the wolves of segregation and poverty, in 1907 Anna Alexander became the first African-American deaconess in the Episcopal Church — a “set-aside” role for women before they could be ordained deacons. Anna Alexander died in 1947, an old woman who had laid down her long life — not in dramatic sacrifice, but in faithful service to her community, to children, and to the Shepherd she followed. There is more than one way to lay down our lives. I hope and pray that this nation will come to its senses about gun violence, before another student, or teacher, or police officer, or bystander lays down a life to save others. Of course, there are countless other wolves, other dangers, in our fragile society. Still, I have hope — gospel hope. And one of the things that gives me hope is the faithful, quiet, persistent service of shepherds like Anna Alexander, shepherds like YOU who follow the model Shepherd. In whatever YOUR occupation and vocation, YOUR faithful, quiet, persistent service leads this nation to greener pastures and stiller water. In this way, through the One who laid down his life for us, we may all offer our lives for the sake of love. “Two-thirds of millennials don’t know what Auschwitz is,” Washington Post, April 12, 2018. Do not think I have come to bring peace to the earth — not peace, but a sword. provides the power to do such a thing. . . . I tell you this story not because I need sympathy ( OK, I do, a little) but because today’s gospel asks us to rethink our devotion to our families. For even though Jesus says that our “foes will be members of [our] own household,” I don’t think he wants me to abandon my grandchildren. I don’t think Jesus means me to ditch my daughter when she most needs to keep her job and support these boys and their baby sister. But he does mean there’s a choice to be made. Today’s gospel is part of a long speech Jesus makes to his chosen disciples as he sends them out to do the mission work of the kingdom. He’s warning them of the difficulties they’ll face, the divisions they’ll endure, the betrayals they’ll suffer — even the lives they stand to lose. He’s also holding before their eyes the promise: that those who lose their life for my sake will find it — that death is not the end, that LOVE is stronger than death. Alban, whose feast we celebrate today, must have heard that message. You probably know his story better than I do, but it’s one that bears repeating ¾ especially in a world that is increasingly hostile to the Christian message. Alban was not a Christian, but a pagan soldier, when his story — at least the part we know — begins in southern England. We don’t know anything about his father and mother, brothers or sisters, much less his grandma. But as we’ll see in the story, we do know something about who he considered his family to be. a family worth shedding his own blood for..
provides the power to do such a thing. For love is stronger than death. It was LOVE that drove a man a month ago to kiss his wife goodbye in the morning, to call her on the way to lunch with a co-worker, and then, before he could enter the restaurant, to step between another woman and the gunman confronting her in the parking lot. Without hesitation, Mike Winffel took the bullet meant for a stranger. With an extension of the same kind of LOVE that drew him to a thousand small kindnesses for his wife, children, and neighbors, Mike Winffel lived the words of today’s gospel . . .
in the terrible hours after his death? Gently, the pastor corrected her. “Heroes are for the media,” he said. Provides the power to do such a thing . . . The power of LOVE also drove a bouncer to risk death in Orlando’s Pulse nightclub to open a back door and allow 70 people — 70 brothers and sisters — to escape the horror . . . The power of LOVE led teachers to shield children — as if they were their children — with their own bodies from the terror at Sandy Hook three years ago. A witness to the LOVE of Christ. But meanwhile, we have a parish picnic to put on . . .
bound not by blood alone but by Christ’s body and blood. That can provide the power to do such a thing . . . He couldn’t help asking, as he languished in a jail cell. His people had waited so long for dawn to rise over a darkened sky. He had drawn the people to him, preaching the way of the Lord, the way of justice and truth. He had traveled in dangerous territory, comforting the oppressed and confronting the powerful. While he waited, young Martin Luther King Jr. read again the newspaper column that an ally had spirited to his cell. And with the question on his heart, he began to write, in the margins of the newspaper, the words that would one day be known as Letter From Birmingham Jail. “Are we to wait?” another prisoner, 20 centuries before, wondered. John the Baptizer’s people had waited so long for the One who was to come, the Messiah. John had traveled dangerous paths, drawing people to himself, drawing them to God. Though his words were full of fire and axes and winnowing forks, his hope was in a new, rose-colored dawn. The One for whom they had waited was very near, the one whose sandals he was not fit to carry . . . at least the one he thought was the One. But now John sits in jail ¾ or I imagine, he cannot sit. The wild man who once had all wilderness to wander in, paces, in a cell smaller than one of our parking spaces. He walks alone, for his captors cannot allow him to poison any other minds with talk of a kingdom that is not Herod’s, a kingdom John swears is coming. Because anytime now that “the one more powerful than I” wants to demonstrate his power — and set John free— would be OK with John. How long, O Lord? “Wait” is what the white clergymen of Birmingham had advised Dr. King to do in an open letter published in the newspaper he held. The demonstrations he led were called “unwise and untimely.” Why had he come from Atlanta to confront the segregated businesses of Birmingham? Having been invited by other Southern leaders, he came to teach about nonviolent resistance, which includes willingness to be arrested for violating unjust laws. Because the powers in Birmingham ¾ modern-day Herods, you might say ¾ had outlawed all public demonstrations, King went to jail on Good Friday 1963 for failing to obtain a parade permit. And there, for a full week, he waited, thought and wrote. “We will have to repent in this generation not merely for the hateful words and actions of the bad people, but for the appalling silences of the good people. . . .
the King who came and is still coming. John was to continue to wait, in faith that the Messiah was at work, that God was at work. He was to wait, though as we know, his waiting would end with execution. He would become a forerunner of Jesus in every way. John remembered that, as Isaiah tells us today, when the eyes of the blind are opened and ears of the deaf unstopped, when the lame walk and the lepers are cleansed, all these are signs. Not of immediate victory but of eternal hope. And so we wait. Here on the third Sunday of Advent, we wait, not just for the birth we’ll celebrate in two weeks, but for the full inbreaking of the kingdom of justice and healing and rose-colored dawn. We wait, but we do more than wait. For like John, like Martin, we do not wait without hope. We wait with those who suffer imprisonment, as far too many young black men do. no prospect for proper education or employment. We wait, but we also work. That is our call this Advent. For if we accept and sanction the way things are, the Church risks, in Martin Luther King’s words, being “dismissed as an irrelevant social club with no meaning” for our times. I think John the Baptist would agree. I think Jesus would agree. Martin Luther King Jr., Letter from Birmingham Jail, 1963. Sounds simple, this advice from Jesus, doesn’t it? In our crazy-busy world, setting aside some time to just BE, and to BE with God, might be the Hardest. Thing. Ever. It’s so easy to get distracted ¾ I know, because it happens to me every time I try. But today I pledge to try again, because today we begin again the season of Lent. And Lent is all about trying again. Jesus, who knows the human heart, knows how hard we try. And Jesus knows that trying to come close to God is full of pitfalls. Sometimes when we think we’re doing something for God, we are fooling ourselves. We’re really doing it for the good feeling we get, or for the praise of other people, or for adults, for the tax deduction. And you know what to do when you realize that’s happened to you? You try again. What Jesus says in today’s reading about people who do everything for show ¾ “the play-actors” who care mostly about impressing God and other people ¾ reminds me of a story I heard recently, about a cake. This cake was decorated splendidly with ribbons of icing, sugar medallions, lavish sparkles and silver stars. But only the top layer was really cake. The rest was decorated Styrofoam. Pretty on the outside, hollow within. Jesus never heard of Styrofoam, but I think that cake is something like the people he was telling his disciples ¾ telling us ¾ not to be like. “When you do something for other people,” he says, “don’t call attention to yourself.” So I wonder if that’s something all of us can TRY to do this Lent. At least once a day, why not do something for someone else without mentioning it to anyone? Maybe just the person you helped will know, say letting a classmate get to the water fountain first. Or maybe even the person you help won’t know, if you do something kind but invisible, like picking up something they dropped and putting it on their desk. Such “random acts of kindness” are a good way for all of us to live this Lent. Kind acts shine like stars, silently lighting up the darkness. When we do kind acts, we come very close to God, without even trying. Amen. In the name of our loving, liberating, and life-giving God. Amen. My soul magnifies the Lord and my spir .… wait a minute! How can I, a small human being, magnify God, who is already bigger than the entire universe? How could Mary magnify God, and how could Jonathan Myrick Daniels, whose life and martyrdom we remember today, make God any larger than God already is? How can any of us magnify the enormous, all-encompassing, great Creator God? The question used to trouble me back when I was a small, strange child who thought too much about the words of prayers and songs I heard every day. And I did hear daily the words of Mary’s song, the lovely Magnificat we just heard her speak in the gospel today. My family’s daily recitation of the rosary – five decades of one Our Father, 10 Hail Marys, and a Glory Be (yes, you counted right, that’s 50 Hail Mary’s) – was made even longer by additional prayers to which my dear mother was devoted. Is it any wonder my mind wandered? Back then, it was just an attempt to stay awake, but today I would give more credibility to my straying thoughts, acknowledge the value of repeated, rhythmic prayer, and call my mind’s wandering “wondering.” So, I still wonder how a small human being can magnify our magnificent God? Mary was just a small, human being — maybe 14 years old — when she journeyed to a village in the Judean hill country, seeking out the company of her older cousin Elizabeth. Now Elizabeth was advanced in age, 29 or 30, and she had given up hope of becoming a mother. But Mary knew Elizabeth’s secret, told her by the same angel Gabriel, who had announced that God had chosen her to be the mother of God. So Mary, filled with good news, and also with her growing baby, set out to see Elizabeth to celebrate with her, perhaps, or to avoid nosy neighbors – but above all, to exult in what God was doing for the whole, wide world in her small body. Near the site where this Visitation happened, there is a church. That is one way we humans magnify the things that matter to us: we build. Somewhere below the bulk of the Church of the Visitation, lies perhaps a well where two women would have met. Or maybe there’s a patch of dirt where Elizabeth was tending her beans when her young cousin labored up the hill. For not only has God done great things for Mary, God is doing great things through her for the good of the world. In her small, human body that day, Mary carried the One who will fulfill those promises, the Ruler of the Universe who for a time consented to be protected only by the frail flesh of a teenage girl. The Word became vulnerable and dwelt among us. except in the body of one small human being. How can a small human being like Mary magnify the Lord? How can a small human being like Jonathan Myrick Daniels? It was Mary’s song, Magnificat, that inspired Daniels 50 years ago to travel unprotected to Selma, Alabama, to take part in civil rights activities. Then a seminarian at Episcopal Theological Seminary in Massachusetts, Daniels could have stuck to his studies and let others take the risks. Daniels’ path to seminary had not been easy. While a student at Virginia Military Institute, he had experienced a crisis of faith that continued for several years, after by the death of his father and prolonged illness of his sister. An Easter service moved his heart, and he decided to study for the priesthood, planning to graduate in 1966. But plans change. In the spring of 1965, the Rev. Dr. Martin Luther King asked students to join him in Selma, and during evening prayer at the seminary chapel, Daniels, who had heard King’s call, heard the words of Mary’s song. Once there, Daniels knew that a drop-in weekend visit was not enough. He returned to school, but only to get permission to stay in Selma and study on his own while working to register black voters. He tutored children, helped poor people apply for aid, and assembled of list of resources for people in need. On Sundays, he worked to integrate a local Episcopal church, although the group of African-American students he sat with were … tolerated, not welcomed. On August 14 that year, Daniels was one of a group of 29 protesters who went to Fort Deposit, Ala., to protest stores that had a whites-only policy. There, they were arrested and spent 6 days in a crowded jail without working toilets, showers or air conditioning—and this in the crushing Alabama heat. Daniels led the group in hymn singing and prayers to boost their morale. Finally, freedom came (though some say the group’s sudden release was a setup). Longing for a cold drink, Daniels and a Catholic priest, along with two young African-American women, walked the 50 yards to a small grocery where they had shopped in mixed groups before. This time, however, they were met at the door by an unemployed highway worker who had been deputized as a sheriff. The man leveled a weapon at one of the teenagers, Ruby Sales, but before he could fire, Jonathan Myrick Daniels pushed Ruby out of the way. The shotgun blast, pointblank to his chest, stopped his hero’s heart. His killer was acquitted by an all-white jury. Jonathan Daniels has been remembered in the church’s calendar since 1991, but that, of course, was not his purpose in going to Selma or in laying down his life to save Ruby (who, incidentally, has stayed the course, becoming a lifelong leader in human rights efforts). Daniels wasn’t out to glorify himself, but to magnify the Lord. He did it in the same way that his beloved Virgin Mary did — by placing his vulnerable, human body at the service of the Creator of the Universe. Our vulnerable human bodies, with the minds and spirits they enclose, are all we have to offer to God or to God’s beloved children. Christians from all over the country, including many from our diocese led by Bishop Shannon Johnston, have used their bodies this week to walk a pilgrimage, moving from the Hayneville, Ala., Jail where Daniels was held, to the site of the store where he sacrificed his life, and on to churches for worship. I wasn’t there, but I think it’s a safe bet that as they walked, this group of pilgrims sang – sang songs of hope, songs of peace, songs of justice and freedom, songs of love. I can well imagine they sang Mary’s song. What do Mary’s song, what do Jonathan’s sacrifice, mean for us? How do we small, human beings magnify our impossibly enormous God? In our own small, human, vulnerable, bodies, that’s how, as we take risks for what is right and just, and for people who are also beloved by God. We magnify God as we live like we believe what St. Paul writes in Galatians: that we are all children of God, for “there is no longer Jew or Greek, there is no longer slave or free, there is no longer male and female,” there is no longer black and white, or gay and straight, or native and immigrant, or young and old, or east or west or north or south, or anything else that separates and divides the children of God. When we live as if we truly believe that truth, sacrificing perhaps not our lives but our prejudices, our comfort, our plans, and our treasure, our magnificent God will be magnified for all to see. High on the mantelpiece sat a plain, woven basket. Every Advent, my mother would bring it out, show us a china figure of the infant Jesus, and announce that it was our job to prepare a bed for him. Every good deed we did — every time we obeyed our parents, or helped a brother or sister, or did our homework without being reminded — we got to place a “straw” — a piece of yarn — in the basket. You might think it got filled up pretty quickly with 8 children contributing – but we were just ordinary kids, and so, many of those yarns got taken away because we fought, or forgot to do our chores. Mysteriously, though, by Christmas day, that baby always had a soft, cozy resting place. Today, in our reading we heard about the person who made Jesus his very first resting place. Now, Jesus was a special baby, but he had to be born, just like any ordinary baby. He needed the same things other babies need. And do you know what a baby needs most of all? Every baby needs a MOTHER. Without a mother, there is no baby! So this is the story of Jesus’ mother, Mary, and how she came to BE his mother. She was just an ordinary teenager on that warm spring day, when a soft breeze was blowing through the olive trees and playing the branches like strings on a harp. Mary might have been watching the leaves dance, or hanging the laundry out to dry, or feeding the chickens. She might have been praying. We don’t really know. We DO know that suddenly, something changed. On that ordinary day, something EXTRAordinary happened. Suddenly, there was an EXTRAordinary sound, and Mary heard a voice she had never heard before. Mary wondered how that could be. She wondered how someone as young as she was could be a mother. She wondered how someone as ordinary as she was could be the mother of God. That is Mary’s story. And it is your story, too.